Keywords: Medicinal plants, Mycroflora, Toxigenic fungi, Mycotoxins. A total forty samples of eight different medicinal plants were taken for the detection of toxigenic fungi and their mycotoxins. The fungal mycroflora comprises of six different fungal species belonging to three genera. A. niger, Mucor species, A. flavus and Rhizopus species dominate other fungal species isolated. Among ten samples of different medicinal plants which were contaminated with A. flavus was further analysed for mycotoxins potential. Four of them shows positive results for mytoxins potential. Although the presence of toxigenic fungi in a product did not imply the presence of mycotoxins in the product, their presence represents a potential risks of contamination with mycotoxins. Therefore, these medicinal plants should be carefully stored and the growth of the naturally found toxic fungi should be inhibited. Beside that, these medicinal plants must be tested for the presence of mycotoxins present prior to their use. Keywords: Medicinal plants; Mycroflora; Toxigenic fungi; Mycotoxins. © International Journal of Applied Sciences and Biotechnology. 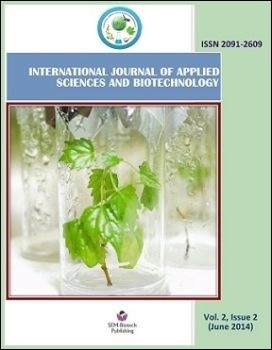 International Journal of Applied Sciences and Biotechnology is licensed under a Creative Commons Attribution 4.0 Unported License.